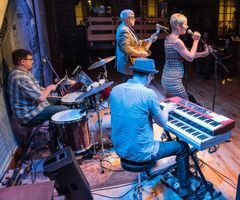 Miss Melanie & the Valley Rats play Rhythm, Blues & Soul every Friday night at 9:00 PM at Otto's Pub and Brewery in State College. Miss Melanie and the Valley Rats have appeared with B.B. King, Jay Leno, Johnny Winter, James Cotton, The Nighthawks, J.J. Grey, Billy Price, Robert Randolph and a host of others in the seven of being together. Miss Melanie can flat out sing. Her giant voice, with tons of range and soul is the centerpiece of the band. She can whip a dance floor into a frenzy or turn them quiet enough to hear a pin drop when serving up a soul bearing ballad. She has cultivated a loyal fan base with her nearly inimitable voice. Combined with Queen Bee and the Blue Hornet Band alumni Mark Ross on guitar, Rev. James Harton on organ and Chris Coyne on drums, they lay down the perfect groove-laden floor to express themselves. While no stranger to backing a great singer, Ross' in the pocket, tasty, and soul drenched guitar playing add to the party. Harton's organ is the perfect bed for Morrison and Ross, but make no mistake about it, when it's time for Harton to step forward, he roars and moans with the mighty sound of a seasoned veteran. Chris Coyne holds down the drum chair with a less is more and elegant approach that makes this band all come together. This is a band that truly gets it. One listen and you are hooked!